Once upon a time not so long ago (in 2002) when Ajay Devgn played Dawood Ibrahim in Ram Gopal Varma’s Company he was shown smoking or holding a cigarette throughout the film. No one objected. 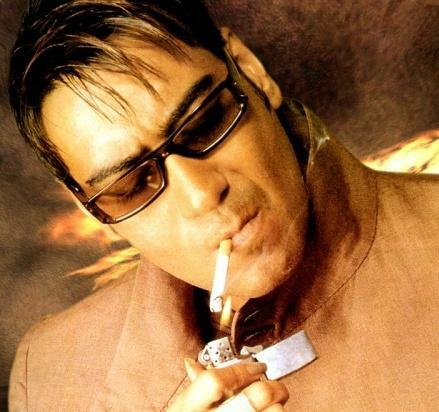 Not even Devgn, who was an oblivious smoker back then. Much water has flown since then. Now when Devgn plays another character based on a real-life gangster in Once Upon A Time In Mumbaai he’s again shown chain-smoking. Today any character smoking on-screen invites immediate censorial rectification. Even Devgn, who has a little daughter and pregnant wife at home had cut down on his smoking. But the the chain-smoker’s role in Luthria’s film has gotten him addicted to cigarettes once again. Ok, let’s get this straight. Haji Mastan was a chain smoker. So is Ajay Devgn, who plays a smuggler from the 1970s. He smokes through most of Milan Luthria’s Once Upon A Time In Mumbaai. Until very recently the censors clamped down on any character holding a cancer stick in his or her hands. In fact, censor chief Sharmila Tagore was at her wit’s end when in April this year the government sent the censorboard a circular stating that if any character in any film lights up a cigarette the film automatically gets certified for adult viewing. Despite showcasing Devgn puffing away the cancer stick in Once Upon A Time in Mumbaai the film has been awarded a ‘UA’ certificate. How on earth did Devgn and the film get away with it?